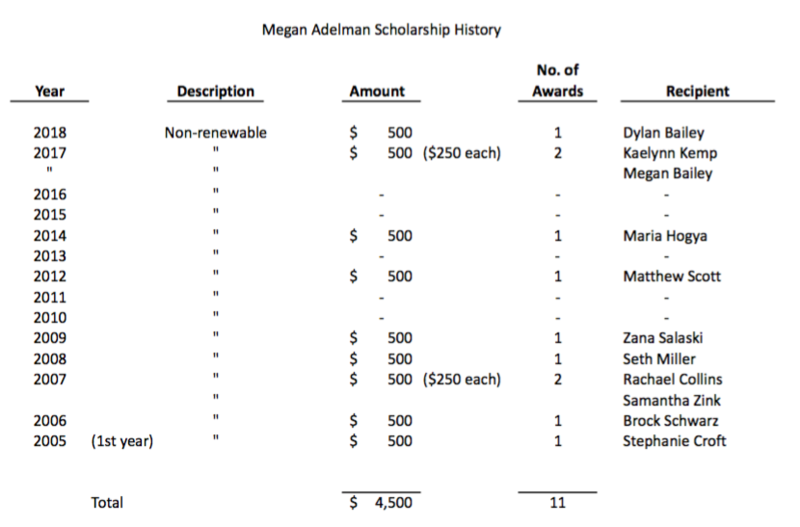 The Megan Adelman Memorial Scholarship was established in memory of AHS 2004 graduate Megan Adelman who died as a result of a parachute accident at Fort Benning, Ga. While at AHS, Megan excelled at cross country, qualifying for the state meet three times. She was a leader on her team and inspired others to do their best. Following graduation Megan knew that with two siblings already attending Ohio U. it would be a financial hardship on the family for her to go to college. Instead she opted to join the Army. Following basic and advanced training she was sent to Fort Benning for airborne training. At one point during her training she told her mother that she might want to become a Drill Sergeant. Her mother said, “Well you’re bossy and you’re organized, so I don’t see what would keep you from doing it”. She was assigned to go to the 82nd Airborne Division upon completion of her training. However, on January 25, 2005 Megan died when her parachute failed to inflate on the second of five jumps she was to make in the last of three weeks of training. In recognition of Megan’s love for cross country, her family and friends, led by her mother Melissa Adelman, her sister Tina and brothers Marcus and Matthew, organized 5K runs/walks to establish the initial endowment for a scholarship in her memory to be awarded to AHS cross country athletes.